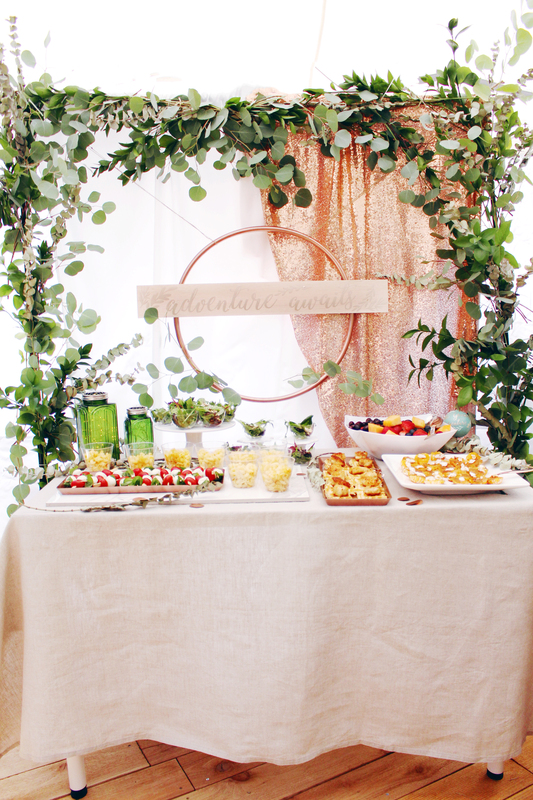 Copper, emerald, sage, mint, and lots of greenery make this adventure awaits baby shower classy yet adventurous! 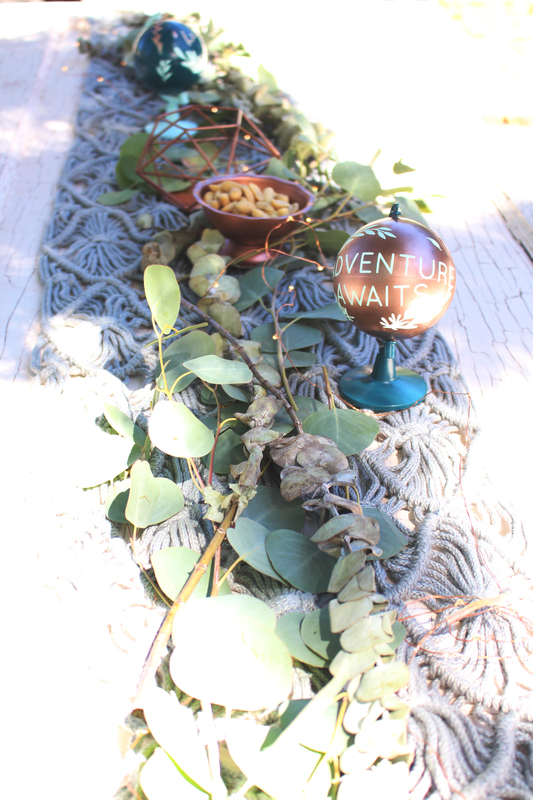 A fun adventure theme gets dressed up for Malissa’s expected baby boy! 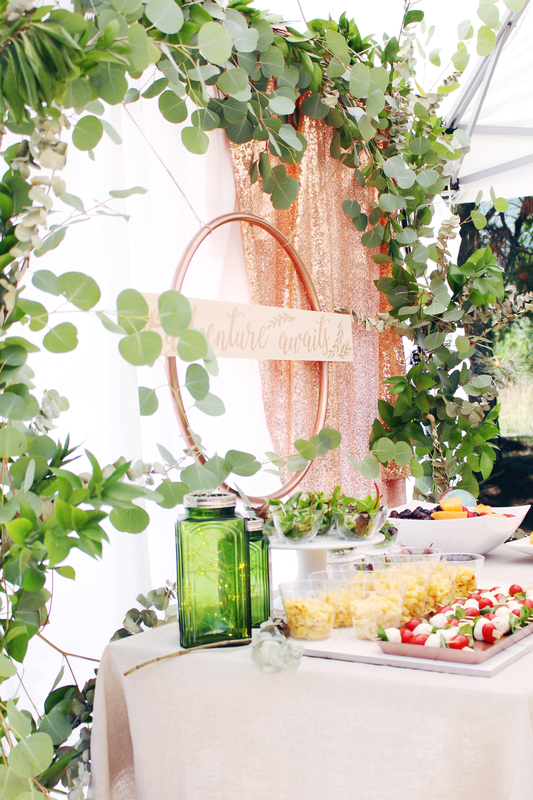 I am so excited to hop on today and share Malissa’s baby shower we threw for her two weeks ago! (wow how has it already been that long?!) I have so much to share with you–I know our blogging has been…spotty lately to say the least…but hopefully we can remedy that here soon! 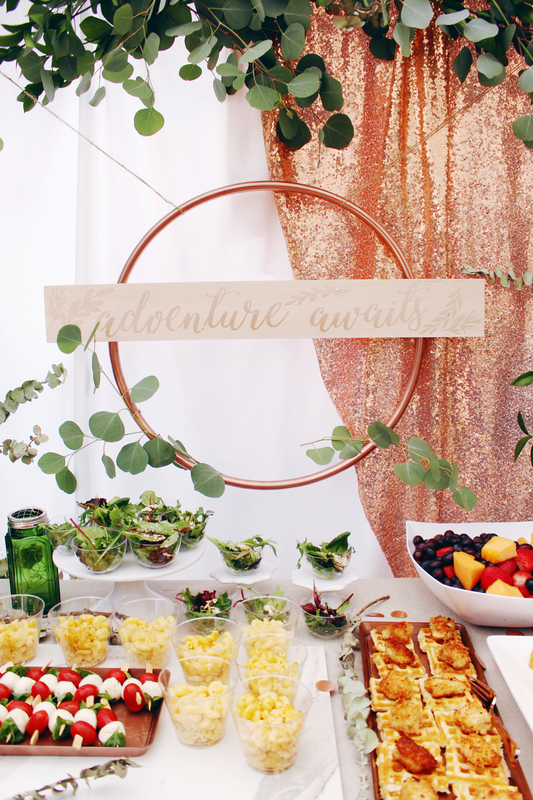 And I thought, what better way to start than with this Adventure Awaits Baby Shower theme! 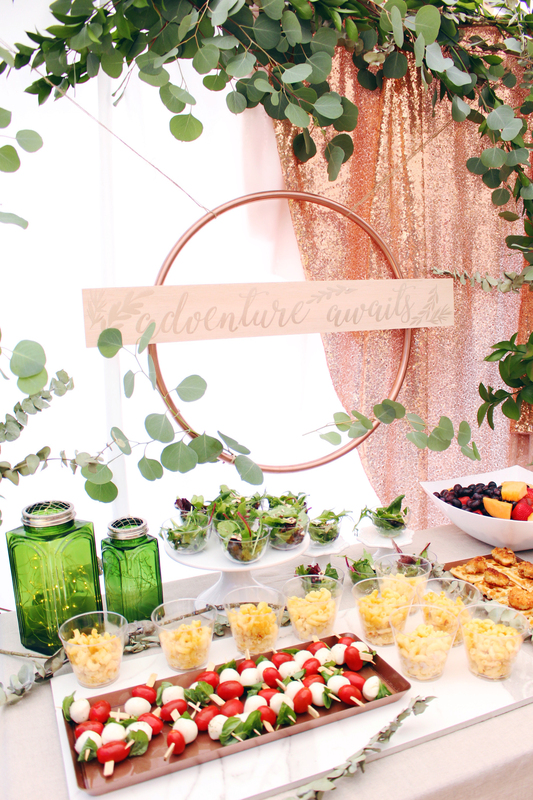 I think for years I had kind of planned on doing some sort of adventure/travel theme for Malissa’s baby shower when the time came, because her and Greg are such huge travelers! It seemed fitting, but then I had kind of abandoned the idea as I began planning this. I wanted it to be a little more grown-up than I had originally planned. 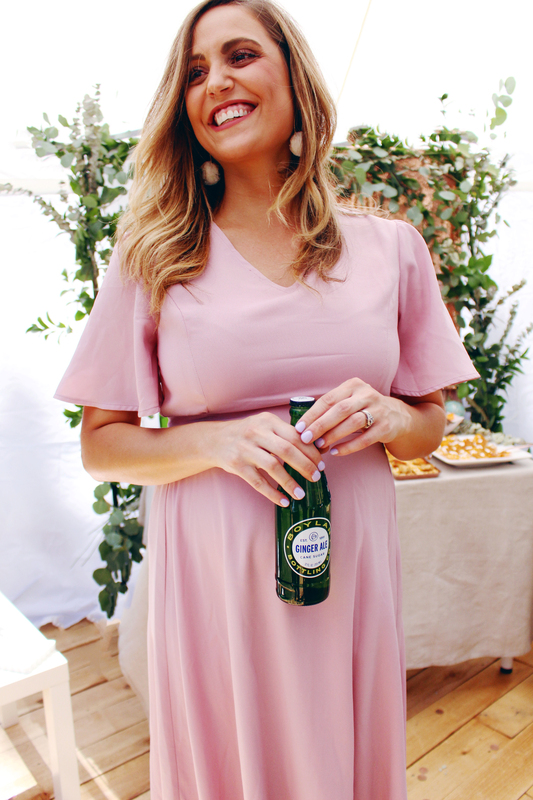 Even though it was a baby shower, Malissa and Greg are practically ancient now (hehe…jk guys) and I just felt like I wanted to use a more sophisticated color palette. I settled on copper, emerald, and sage pretty quickly and forgot all about maps and globes. For a guest sign in book, I spray painted a little globe (found at Walmart) with the Rustoleum Chalked in Serenity Blue and left out an array of markers. 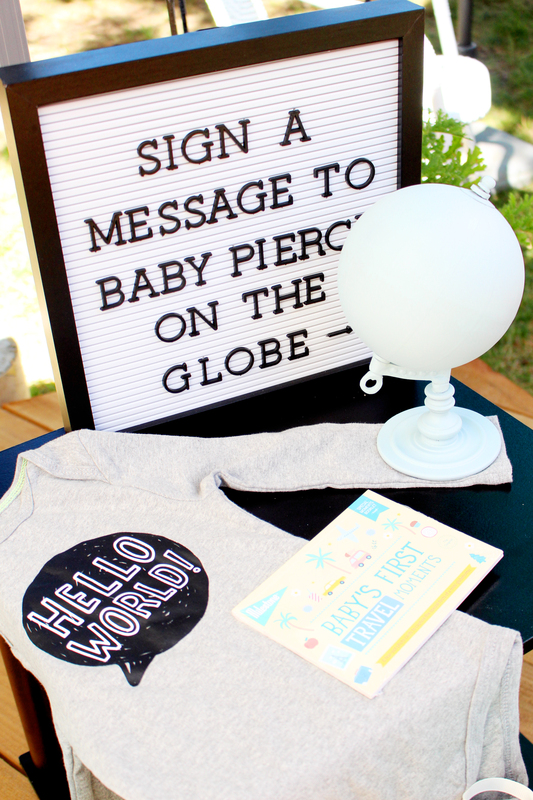 I love doing something like this at a baby shower that the mom can take home, use in the nursery, and have as a keepsake forever! 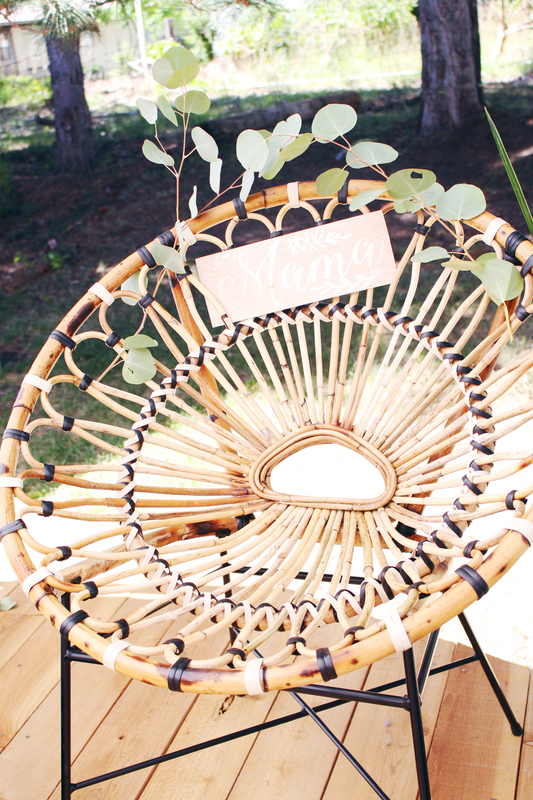 Another of my favorite details was this amazing chair that I attached a sign to for Malissa to sit on for her present opening. 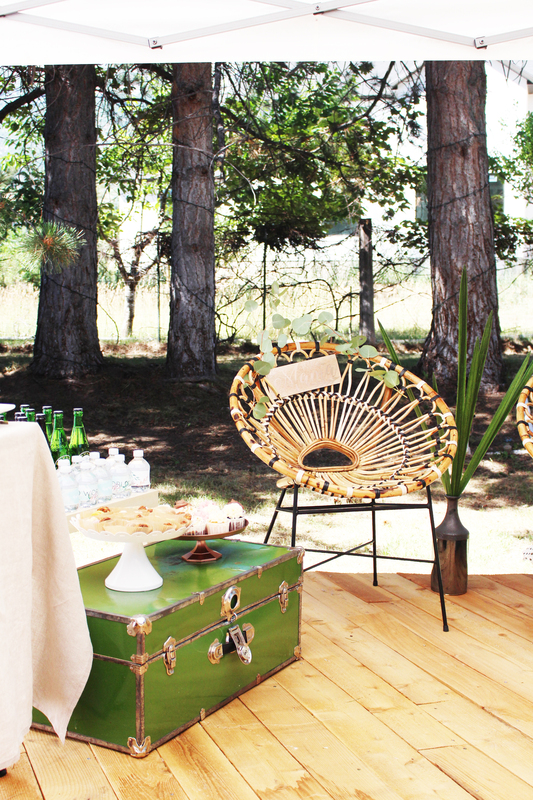 It’s the Daisy Lounge Chair from Article and I couldn’t be more obsessed. 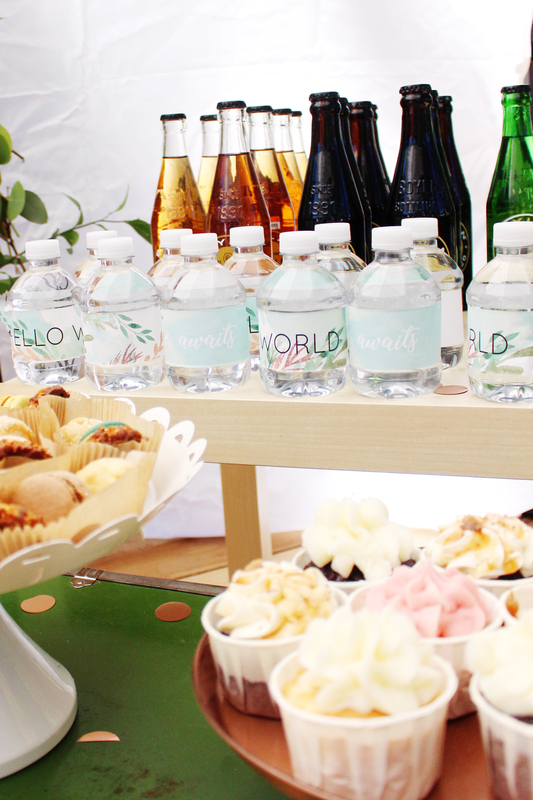 We had such an amazing, delicious array of food, I wish I could go back just to eat it all again! 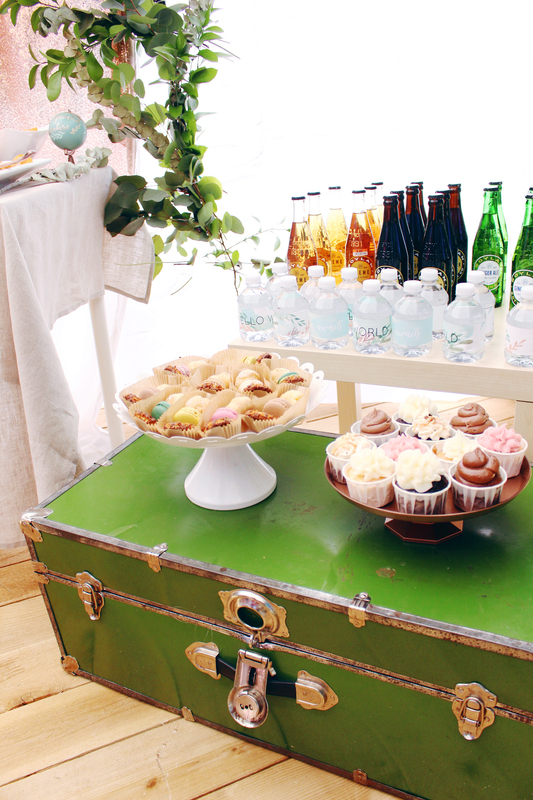 I used my vintage green trunk to display our favorite local cupcakes (From Sugar High Confections–previously known as Dippidee) and a little treat cup of some of Malissa’s favorite cookies: macarons, samoas, and a cream puff. 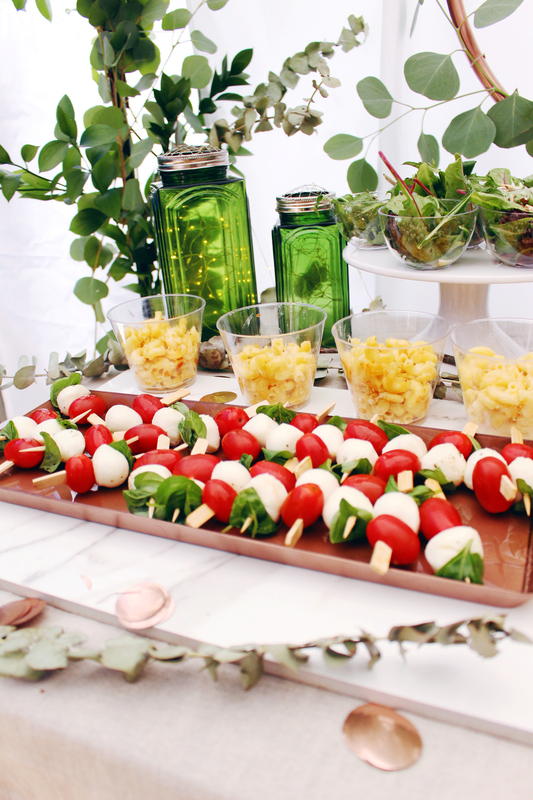 For savory appetizers, we did mini caprese kabobs, mac n cheese (another Mal fave! 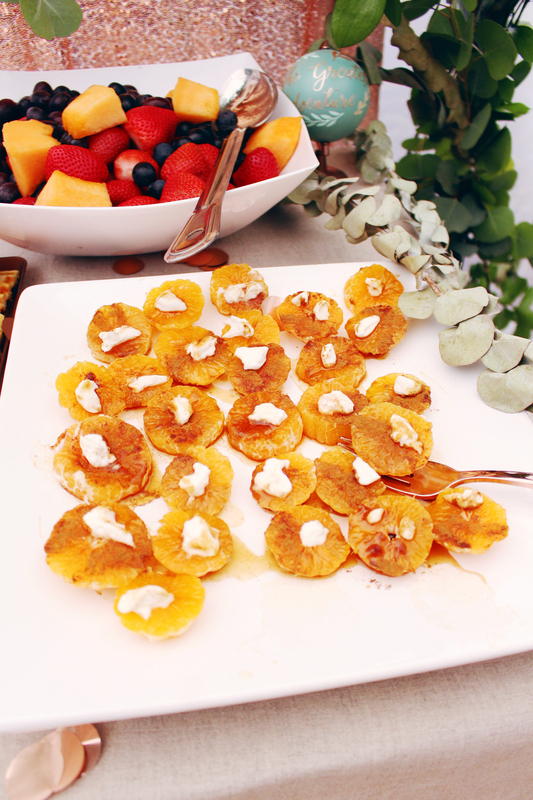 ), citrus salads, mixed fruit, these delectable little orange slices, and mini chicken and waffles (Malissa’s very favorite meal!). The chicken and waffles was so fun to do, both my mom and I saw the idea online and immediately wanted to do it, knowing how much Malissa loves the dish! My mom made some easy fried chicken bites beforehand, then heated them up in the oven for a few minutes before serving. We used a square waffle iron and cut them into small squares! 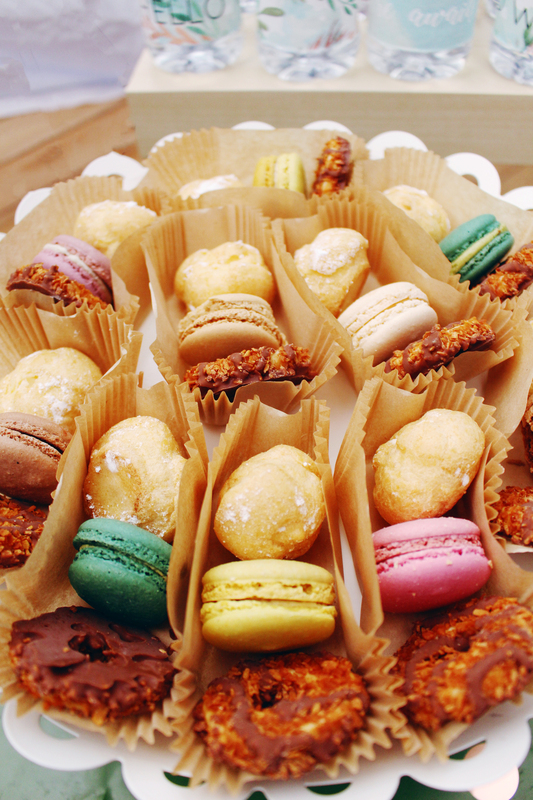 We wanted to use mini Eggos but after checking 4 stores, we’ve determined they must not make them any longer. (But I did discover just this week that Earth’s Best brand still makes them and they are at Sprouts!) 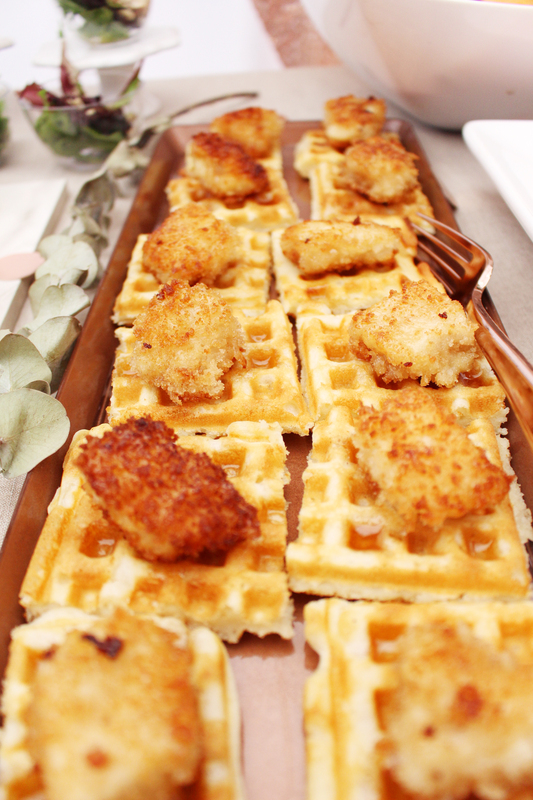 So, for a super easy option, grab chik-fil-a nuggets and mini frozen waffles! But this way truly wasn’t not that hard, and was extremely cost-effective! Malissa’s entire family of in-laws surprised her by taking a road trip here from Idaho (after telling her none of them would make it!). 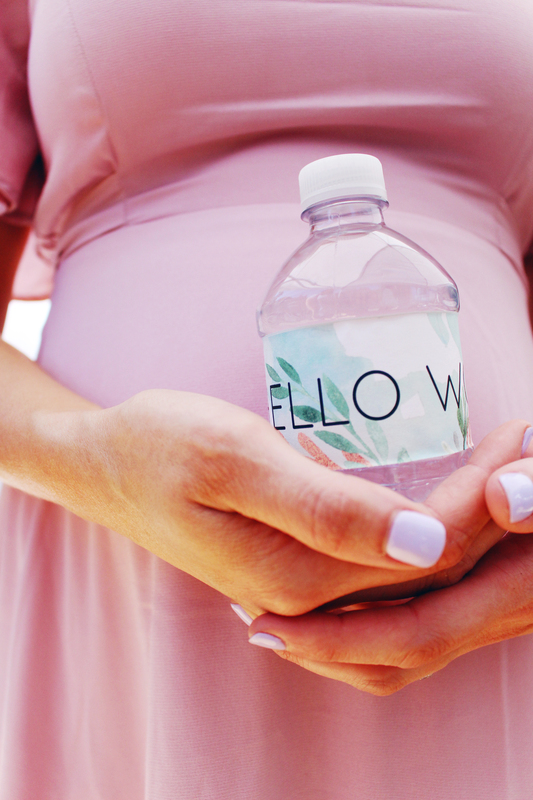 It was such a joyous occasion, all of us coming together to celebrate the cutest pregnant person ever!! Just look at her!! I couldn’t be more excited to meet baby Pierce, I love him so much already and I am so thrilled for Malissa and Greg! I’m so happy I got to plan and share this adventure awaits baby shower for them because truly -their greatest adventure is about to arrive! !